This is the 1998 Danish paperback edition of The Fallen Man, published by KLIM in Århus, Denmark. The text was translated into Danish by Søren K. Barsøe. 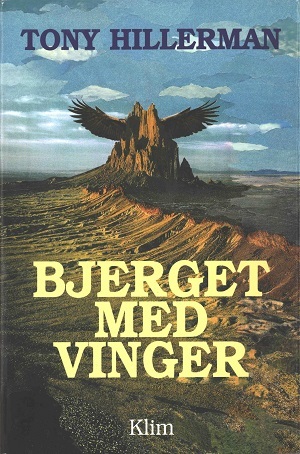 The cover was designed by by Nils-Ole Lund and features a desert scene dominated by a rock formation with wings. The formation is indicative of the rock formation Shiprock which is an important location in the story. The cover also contains front and back foldouts. The front fold out contains quotes from the press praising Hillerman's Navajo series. The back foldout contains a brief biography of Tony Hillerman. Binding: Paper covers with full color picture. The title, author's name and publisher are printed on the spine.